Sorcar at the Jadavpur University program: (left) Receiving bouquet of flowers at the Aban Mahal theater, (Right) with Professor Ajay Ghosh, Dept. of Applied Optics & Photonics, University of Calcutta, wife Shikha, Mr. Rajat S. Mandal, Senior General Manager of Osaram company, Professor S.K. Sanyal, Pro Vice Chancellor, Professor K. Goswami, Jt. Director, SISED, and Dr. (Mrs.) S. Mazumdar, Convener. The performance for Jadavpur University was different than any other show done by Manick Sorcar. The purpose of this visit was mainly to educate than doing business. 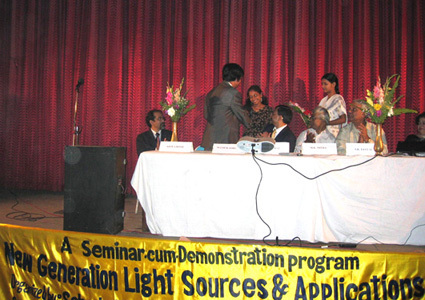 Manick Sorcar was invited by Jadavpur University to be a guest lecturer at the "New Generation Light Sources & Applications" and make a presentation of his laser show as a practical demonstration of the cutting-edge technology to the lighting enthusiasts and techo students of the university. 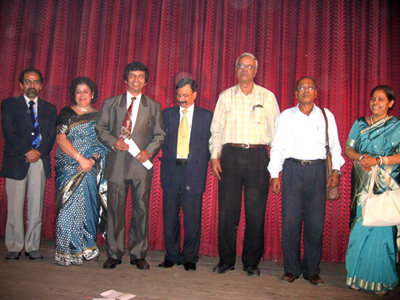 Held on February 6, 2006, the half-day Seminar was organized by the School of Illumination Science, Engineering & Design of Jadavpur University, at the Aban Mahal theater, Dhakuria, Kolkata, India, under the leadership of Dr. (Mrs.) Saswati Mazumdar. After the inaugural speeches by the hosts, the Seminar's first speaker was Mr. R.S. Mandal, Senior General Manager of Osram India (Pvt.) Ltd, New Delhi, who spoke on "Innovation & Contemporary Applications in General Lighting". His topic covered a general description and application of a range of sources such as incandescents, fluorescents, high intensity discharge (metal halide, high pressure and low pressure sodium) to Light Emmiting Diodes (LED's). Professor Ajoy Ghosh, Dept. of Applied Optics & Photonics, University of Calcutta, gave a lecture on "Laser: Light Fantastic" explaining the fundamentals of laser, how it is built by various lasing medium and how it is used in application. The topics of the two seasoned lecturers were excellent in laying down the foundation and an introduction to Manick Sorcar's speech topic "A Painting brush: Made with Laser", which dealt with the application of laser in the entertainment industry. Manick Sorcar explained how the narrow but strong beam of coherent light can be programmed to race along a predetermined path to give the optical illusion of a still graphic, or moving animation with the help of a slew of new lighting equipment such as the actuators, galvos, X-Y scanners, PCAOM's (Poly Chromatic Acousto Optic Modulators) etc. , which was followed by a 18 minute laser demonstration entitled "Reaching the Infinity". Through the practical demonstration, the spectators were able to see how the laser theory was brought into practice, and in the entertainment field how it was used to build graphics on screens, or three-dimensional visuals such as beams, waves, fans, cones, tunnels etc. An informal question and answer session took place back-stage where several students and professors of technology took part. "The application of laser covers a wide range - starting from sensitive eye surgery to drilling through the thickest sheet of steel. In between these two extremes lies a magic-land, where, with this astonishing medium dreams can be built. In the hands of an artist it becomes a brush, in the hands of a lighting designer it is a unique source of light, and in the hands of a magician it is a magic-wand", explained Manick, "if my father (P.C. Sorcar, Sr.) was alive today, I am sure he wouldn't have used an old-fashion buzz-saw to cut a woman in half; I would have designed him a laser-saw to do the spectacular, thrilling act!". Participating as an educator in the seminar and performing as a laserist was a unique experience for Manick Sorcar, who is also an electrical engineer and CEO/president of Sorcar Engineering, Inc., a reputed lighting design company of USA. The experience was specially heart-warming because Jadavpur University is one of the universities that uses his books ("Energy-Saving Lighting Systems", and "Architectural Lighting For Commerial Interiors") as a text for illuminating engineering for undergraduate and graduate level courses.